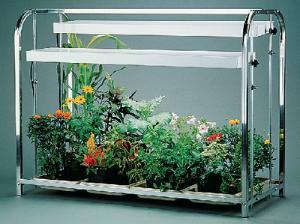 This tabletop adapter doubles the growing area of the Compact Indoor Garden. 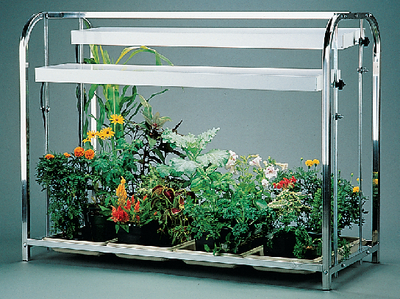 Perfect for tabletops, the innovative indoor garden makes it easy to introduce plant life into the classroom. The garden kit includes a GrowLab: A Complete Guide to Gardening in the Classroom, removable and plastic plant trays, and plastic moisture grids that water plants on weekends. The provided humidity tent provides a moist, warm growing environment. Ordering information: This kit includes 2 light fixtures, 4 plastic trays, 4 moisture grids, a 24-hour timer, a humidity tent, a teacher’s manual, and 1" square and aluminum frames.